If you would like to volunteer your time to clean and beautify our island, please meet on Saturday, July 11, 2009 at 8:00 a.m. behind the Mobil gas station/Mc Donald's restaurant. Come join us and "Pick it Up!" Volunteers will split into groups, cleaning north and south of Aboni Beach until 10:00 am and break for drinks and then continue, if needed. This is a cleanup that should not be missed, so join DEQ's cleanup brigade and "Pick It Up!" Let us work together for the health of our coral reefs and cleanliness of our beaches for everyone to enjoy. For three years Governor Benigno Fitial has been an important component of Beautify CNMI's success. I forget exactly how he put it, but I remember Cinta telling me that he once told his Cabinet to, "give Beautify CNMI whatever support they need." In the last three years government staff and resources have been dedicated to helping us make these islands a better place to live and visit. Most recently, Governor Fitial gave all government offices permission to participate in the island-wide cleanup during working hours. Many of our 4,000+ volunteers were government employees. For all his support, we gave him a limited edition Beautify CNMI volunteer t-shirt (only 400 of this design were printed). I set up an account on Barack Obama's Serve.gov and added an event for the monthly cleanup of the Garapan Tourist District. I'm not sure how much this will help us on Saipan; it is probably more useful in big cities. Either way, I created an event. Beautify CNMI is now a part of Barack Obama's call to service. Generous Donation: Angelo Villagomez (left) and Joe Kaipat (right) accept the donation from Bridge Capital at the Governor's Office this past Thursday. Bridge Capital donated $2000 to Beautify CNMI last Thursday during a ceremony at the Governor’s office on Capital Hill. Beautify CNMI has earmarked the funds to support the Solid Waste Committee, which coordinates weekly cleanups. The donation will fund at least six months of volunteer cleanups. Bridge Capital, LLC is an international investment banking firm specializing in high yield real estate secured lending, distressed debt acquisition and restructuring, equity and debt placement, and investment management services. The company is based out of Saipan, in the Commonwealth of the Northern Mariana Islands. Beautify CNMI! is a coalition of concerned citizens, private groups, and government entities united to enhance the CNMI's natural beauty and foster community pride in its residents and visitors. Beautify CNMI was the 2006 Saipan Tribune Person of the Year, was a recipient of a 2007 EPA Environmental Award and received a Certificate of Commendation from the United States Congress in 2009. For more information visit them online at http://www.beautifycnmi.org. I'm just going to put this on the blog so that it is easy to find. The Environmental Protection Agency blog has a blog post about the Friends of the Monument. Woot! Thanks again to all the sponsors and participants of the Boonie Dog Show! The fun continues tomorrow at PIC where for one day only a one-day water park pass is $10. All funds for the day will be donated to PAWS to help them find homes for abandoned animals. Registration is now open for the 26th Pacific Islands Environment Conference, which will be held on Saipan on June 22 to June 25, 2009, and is expected to draw attendance from government officials and environmental leaders across the Pacific as well as the U.S. mainland. The conference is designed to provide a forum for leaders throughout the Pacific Basin to focus on important environmental issues through excellent speakers and interactive roundtable sessions. On Monday, June 22, there will be pre-conference workshops and a CNMI Energy Summit. The formal PIEC conference agenda runs from June 23 to 25 and will feature both plenary and breakout sessions with a strong focus on clean energy and climate change. Field trips will be held the afternoon of Thursday, June 25. The Pacific Islands Environment Conference is jointly sponsored by the U.S. Environmental Protection Agency and the governments of the Commonwealth of the Northern Mariana Islands, Guam, and American Samoa. Register today at www.regonline.com/PIEC2009. There is no registration fee for the conference, although the field trips and some lunches are subject to a fee. A block of rooms has been set aside at the Saipan World Resort for conference attendees, with rates starting at $100 per night (tax included). Airport transfers are available for a fee. Discounted rental car rates are being negotiated and additional details will be available soon. Those interested in participating in the conference are being urged to use the hotel reservation form on the registration Web site to reserve their room before the May 22 deadline. For more information about the conference, contact Nuria Muñiz at (415) 972-3811 or muniz.nuria@epa.gov, or Michael Mann at (415) 972-3505 or mann.michael@epa.gov. For information on exhibit opportunities, contact Fran Castro at 670-664-8500 or francastro@deq.gov.mp. For additional information and registration, visit www.regonline.com/PIEC2009. And of course, we thank all of our volunteers-you know who you are! PAWS would also like to thank HANMI for the $2,000 donation made for public outreach purposes. The money will be used to create and run weekly “Pet of the Week” advertisements on KSPN so we can place homeless animals in permanent and foster homes quickly. Thank you HANMI for helping PAWS make Saipan a better place to live and visit! In honor of this past weekend’s dog show, PIC is hosting a PAWS Day at the PIC Waterpark this Saturday, June 20, 2009. On this special day, PIC Waterpark passes will be sold at a discounted rate of $10.00, all proceeds will go to PAWS. For more information on this special event, please call PIC at 234-7976 or call PAWS at 285-PAWS. Beautify CNMI announced today the winners of their annual Environmental Champion and Environmental Steward Awards. The awards are given out to recognize individuals, organizations, and businesses that have proven to be environmental leaders in the Commonwealth. 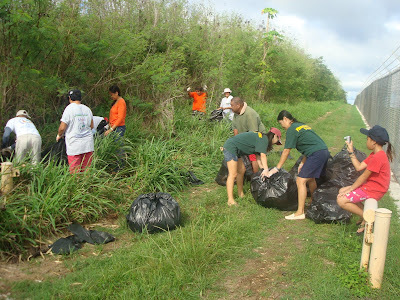 This year Beautify CNMI will recognize Tan Holdings, Laurie Peterka, and Ken Kramer as the 2009 Environmental Champions. Tan Holdings is being recognized as a model of corporate environmental responsibility. Under the leadership of President Jerry Tan, Tan Holdings employees and friends have been part of several environmental projects over the past year. All Tan Holdings offices on Saipan participate in a Reduce, Reuse, and Recycle program and the company participates in a reusable shopping bag campaign with Joeten. 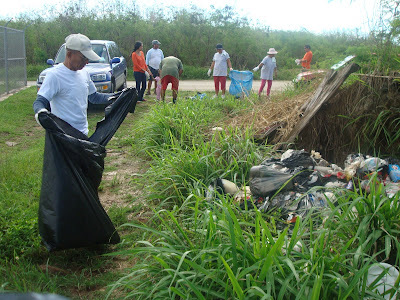 Employees, often with the participation of management, regularly participate in cleanups, including the recent island wide cleanup. Laurie Peterka and Ken Kramer are being recognized for their roles in the creation of the Marianas Trench Marine National Monument. Kramer was so inspired by the concept of the monument that he quit his job so that he would have more time to collect signatures. Kramer was the largest signature collector for a petition being circulated in support of the monument, collecting over 1000 signatures at the street market, in front of stores, at the Sabalu market, and door to door. Kramer also penned nearly two-dozen letters to the editor educating newspaper readers about the benefits of a monument. This year Beautify CNMI will recognize Friends of the Monument as the 2009 Environmental Stewards. 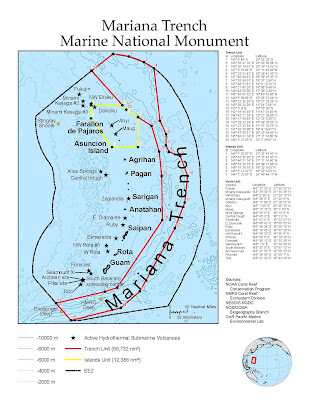 Friends of the Monument was formed to help promote the idea of creating a national marine monument in the waters around the three northernmost islands of the Northern Mariana Islands. The Friends of the Monument engaged in activities to help educate the community --distributing leaflets, conducting meetings, and coordinating with teachers for classroom presentations. The organization gathered more than 6,000 signatures on petitions in support of the designation of a Monument. The Friends sent representatives to Washington, D.C. to meet with White House officials, and participated in television and radio public service announcements and advertising. Ultimately, they were instrumental in the process that resulted in former President George W. Bush designating the Marianas Trench Marine Monument, along with three larger national marine monuments. The awards were handed out at the Beautify CNMI/PAWS Boonie Dog Show on Saturday, June 13 at the CPA Airport Field. Beautify CNMI recognizes Steward and Champion Awards winner each year in Spring. Nominations are taken from the community at-large and the Beautify CNMI Committee Chairs select winners. Past winners include Aqua Resort Club, Friends of the Mariana Islands, Marites Castillo, Kathy Yuknavage, Captain Carl Brachear, Adam Sablan, Katie Busenkell, Rose Callier, Mike Tripp, Marianas Dive, Nava Khorram, Max Aguon, Paseo de Marianas Promoters, and Bree Reynolds. Beautify CNMI! is a coalition of concerned citizens, private groups, and government entities united to enhance the CNMI's natural beauty and foster community pride in its residents and visitors. The coalition was a recipient of a 2007 EPA Environmental Award and received a Certificate of Commendation from the United States Congress in 2009. For more information visit them online at http://www.beautifycnmi.org. 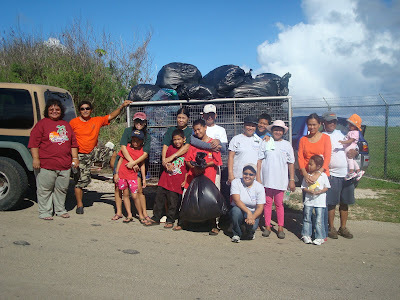 Volunteers from Paseo de Marianas Promoters got up early on Sunday morning for their monthly cleanup of the Garapan Tourist District. They have cleaned important area of Saipan every single month since October 2006. During their regular meeting on June 4, 2009, Beautify CNMI partners brainstormed on projects for 2009 and selected chairs to head four committees. Joe Kaipat of Division of Environmental Quality and Kathy Yuknavage of Mariana Islands Nature Alliance are to co-chair the Solid Waste Committee, the goals of which are to increase the percentage of solid waste recyclables collected, reduce littering, and remove solid waste from local beaches, roads, and villages. The Solid Waste Committee has plans to develop an adopt-a-spot program in conjunction with a marine debris removal and recycling campaign. Angelo Villagomez of the Rotary Club of Saipan, Ronnie Rogers of Historic Preservation Office, and Kathleen Hermann of Division of Environmental Quality will co-chair the Restoration Committee, which will focus on re-vegetation projects and maintaining historical sites. The committee plans to continue work on the Laulau Revegetation Project started by the CNMI Watershed Group in 2005. They also want to start a volunteer corp who will maintain local historical areas. Dr. Dan Lamar of FHP Saipan will chair the Parks & Trails Committee, which seeks to create a system of local, state, and national parks under a Commonwealth Parks System. Laurie Peterka of Practical Solutions and local student Tyler Yoshimoto were named as the co-chairs of a new Beautify CNMI Committee that will launch a campaign uniting youth, the community, artists, and businesses to combat graffiti. “This is something that I’ve been working on with the ISK8 Society for quite some time and I’m really excited to make it a part of Beautify CNMI,” said Peterka. All of the coalition partners agreed that youth education and development through coalition building and partnerships should be an integral part of Beautify CNMI. “It is so important to work with the kids,” said Hopwood Junior High School teacher Kimberly Vaillancourt. The Beautify CNMI coalition has set their monthly meetings for the second Thursday of each month. Meetings will take place at the TO BE ANNOUNCED at 6:00 PM. For more information contact Joe Kaipat at DEQ at 664-8509.